This card often speaks of a skill. The Mark Mason is a degree of Masonry. When he achieves this degree in the order he is expected to create a personal symbol or trademark using 6 straight lines. This mark or symbol is registered at the Grand Lodge and cannot be changed once recorded. It is always imprinted in his work to identify himself to others. When we leave our identification mark on our work for the world to see we know that we will be judged according to a standard of excellence that will create perceptions of us in the minds of many – some of whom may not necessarily even need to see our work to recognize our reputation. Perceptions, once created, are difficult to change. It is for this reason that the Mark Mason would take particular care to ensure that his work is of the highest excellence, for it carries his mark and becomes the symbol of his skill – or lack of it if that be the case. 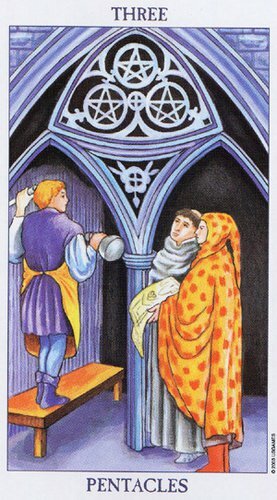 In the card we see three figures. One of these, a priestly figure, holds a set of plans in his hands. The plans represent what is still in the head of the Mark Mason, not yet real or manifest, still in the developing phase; but the real or completed building is also represented in the card. The plans on paper are being compared to the finished product – motivated by the mark or trademark on it. Did he build what he had planned to? Does it meet the mark of excellence expected of him? How will he be judged for his work? Do we stand, like one of the other figures in the card, high on a chair, wanting people to see our mark, it is not hidden it is high and in full view. This figure proudly displays his Mark for the world to see. The priestly figure in the card could represent our connection to a higher Source or Self which may be the reason he is building a temple in the first place. A temple as a place of worship and gathering for the community, so that others may be inspired to connect to their higher Source too so that they can be encouraged to place their mark on their creations and thereby inspire more to do the same. We live by example. We ask ourselves whether the example we see is one we would want to follow. We ask ourselves whether this is someone we’d like to be like, whether they inspire us, or whether this is someone we’d rather avoid. But more importantly, what example are we to those who observe us?